Frank and Ollie are so connected in so many ways that it made sense to me to combine them together for this post. They were hired within months of each other at Disney; they worked on such classic movies as Bambi, Snow White and the Seven Dwarfs, Pinocchio, Lady and the Tramp, and on and on and on. You may not have known who they were, but you certainly knew their work. Frank, for example, was instrumental in animating the spaghetti scene in Lady and the Tramp; the seven dwarfs crying over Snow White in the movie; and Bambi and Thumper on the ice at the pond. Outside of work, Frank was also the piano player in Ward Kimball’s band Firehouse Five plus Two. Ollie was involved in these classic characters in Disney lore — Pinocchio, Bambi, Thumper, the Three Caballero’s (Donald, Panchito, and Jose), Mr. Smee, Winnie the Pooh, Piglet, Kanga, Rabbit, and Roo. What I found fascinating in doing my research is that back in the day, it was common practice for the animator to animate every character in the shot. So, it was conceivable that in a scene in the Three Caballero’s, Ollie would have animated the entire scene with all of it’s intricacies and so forth. Ollie was also an avid railroad fan, as well, along with Ward Kimball, and the two of them were instrumental in encouraging Walt Disney’s love of trains. Ollie worked on his own backyard railroad, helped Walt with his backyard railroad, and later on, purchased and restored a full-sized narrow gauge locomotive. In fact, after it was restored, the train was run during an early morning private event at Disneyland — to this day, the only time that any non-Disney owned equipment has ever been run on Disney property! Afterwards, Ollie sold the locomotive, named the Marie E., to some guy named John Lasseter, where he owns it to this day. Frank and Ollie both retired from Disney on the same day, January 31, 1978. Working together, the two produced a book called Disney Animation: The Illusion of Life, which has been noted to be one of the best books on animation ever written. In addition, they were featured in a documentary called Frank and Ollie, which was produced by Frank’s son Theodore. Frank and Ollie were honored with a cameo in the movie The Incredibles. Frank Thomas died on September 8, 2004, at the age of 92; Ollie Johnston died on April 14, 2008 — the last of Walt’s Nine Old Men to pass away. Wow, great tidbit Cindy! I had no idea, thanks for sharing that! 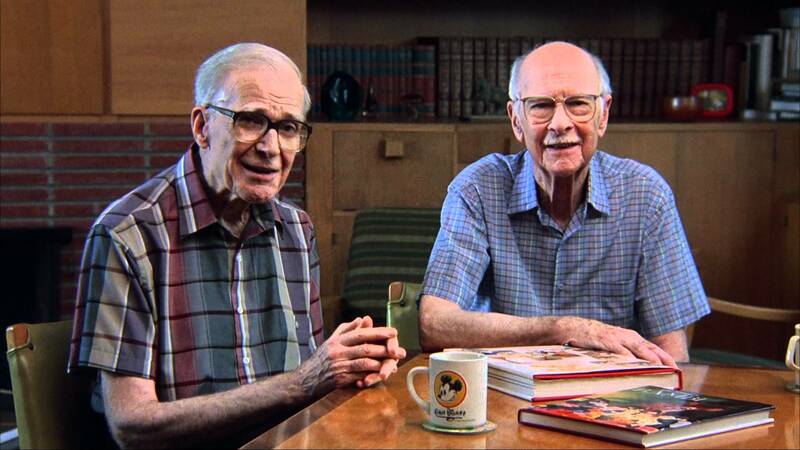 You can hear them mention Tuscola in their video, “Frank and Ollie” about 32 minutes into the film. I have a copy of a letter that Frank wrote to the local museum in Tuscola which included a little about his family’s history there. It’s not the original letter, but still a treasure to me. Great! Thanks for sharing, Cindy! I’ve heard about the movie, but I never saw it. Love these guys. They loved Walt and were such an integral part in the success of these movies. I was watching a special on Walt. In an interview with Ollie he said that when Walt died “I cried on my wife’s lap.” God bless these men for all the joy they helped to bring to people’s lives — mine definitely included. Thank you, Mike! Perfectly said, Brenda! Thanks for commenting, have a great day!